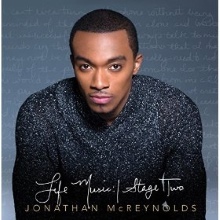 If it has been left up to a teenaged Jonathan McReynolds, the world may never have heard the soaring and buttery tenor featured on 2012’s Life Music and the recently released Life Music: Stage Two. The Chicago native and emerging star on the gospel music scene grew up in church where he first played the drums and then the organ/piano, while also singing in the choir. McReynolds recalls that he was cool with being a multi-instrumentalist and singing as a part of the choir. However, McReynolds’ mother encouraged him to add lead singer to his many God given talents, and the artist slowly begin to reconsider the reluctance that stemmed from his desire to avoid the attention – negative and positive – that accompanies being the vocalist. McReynolds then pursued a bachelor’s degree at Columbia College, where he refined his singing, production and keyboard skills while also learning more about the business side of the industry. It was during McReynolds’ time at Columbia that a series of events happened that allowed his music to be heard by someone who in turn played it on the radio. Once listeners heard McReynolds’ expressive tenor in combination with his writing and production skills, avoiding the mic was pretty much out of the question. At 26, McReynolds brings a level of polish that belies his age. He manages to incorporate much of what is happening in contemporary pop music while also making his profession to Christ plain. There is always more growth that any artist can make, but with Life Music: Stage Two, McReynolds moves to the head of the class, and will undoubtedly have gospel music fans enjoying the right now while eagerly anticipating what stage three will bring. Highly Recommended.